“Moonlight” wins in the craziest incident in Oscar history. Best actress goes to Emma Stone! Best actor goes to Casey Affleck. The best director prize goes to Damien Chazelle of “La La Land,” confirming that the Directors Guild remains the predictive gold standard. Mahershala Ali wins the Oscar for best supporting actor, in line with expectations. As everyone on earth predicted, Viola Davis wins for best supporting actress. It’s Oscar night, and we have all the details on what to expect and what to look out for when it comes to those exciting surprises. 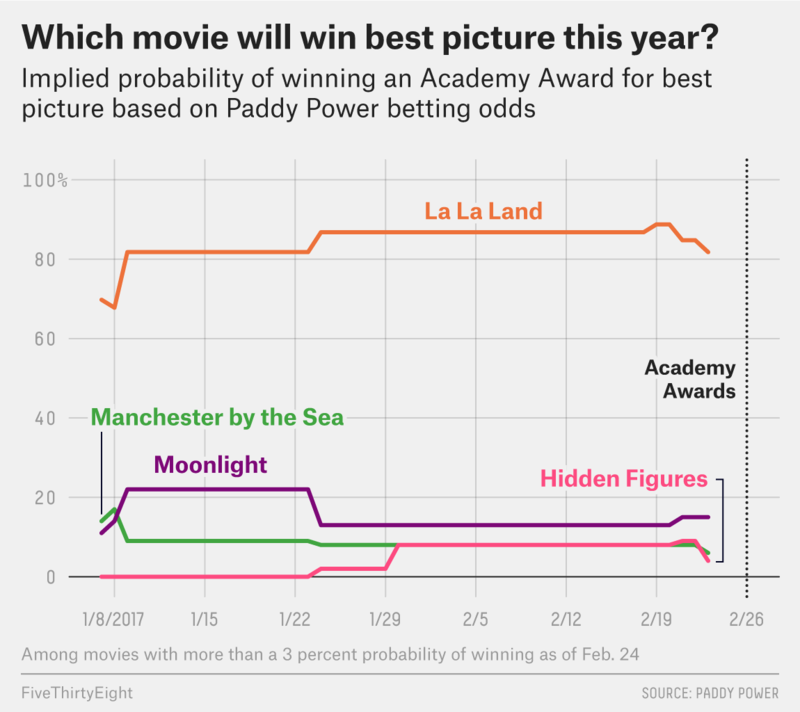 To get a sense of where the race stands, FiveThirtyEight relies on a model that incorporates nominees’ wins at pre-Oscar guild and critic awards, with extra weight given to those prizes that have historically been predictive of the Oscars. This is the category keeping me up at night. 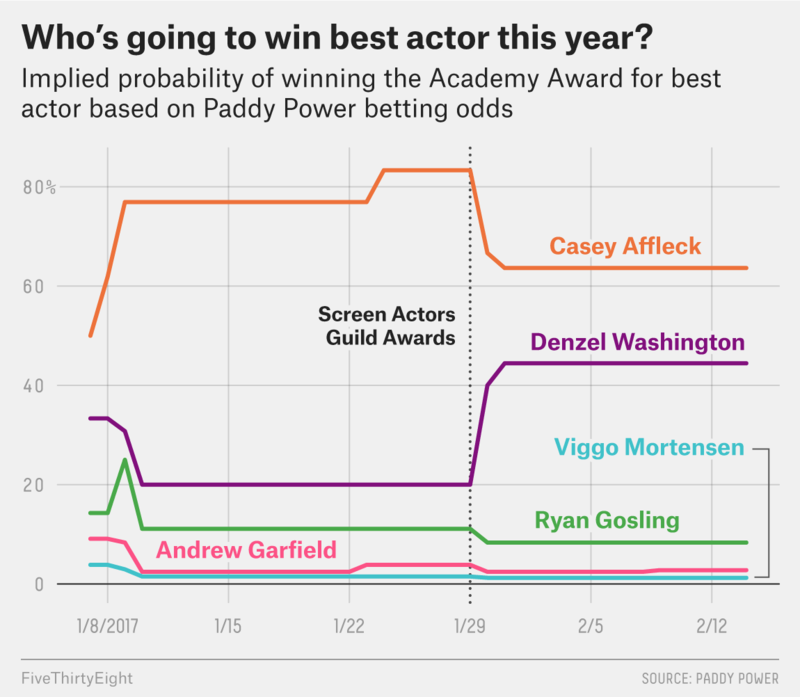 Among the pre-Oscar awards, there is one that is fantastically predictive — meaning that over the past 25 years, it’s the prize that most often recognized the eventual Oscar winner — and three that are OK. Denzel Washington (“Fences”) won the fantastic one, the Screen Actors Guild award. Casey Affleck won the three pretty good ones, the Critics’ Choice award, the Golden Globe (for drama) and the British Academy of Film and Television Arts award. Clearly, we’re reckoning with a bit of mixed signaling here. Our model suggests that on balance, winning three OK awards is better than winning the one really good award. But a Washington surprise isn’t out of the question. This race is close, but not as close as the one for best actor. 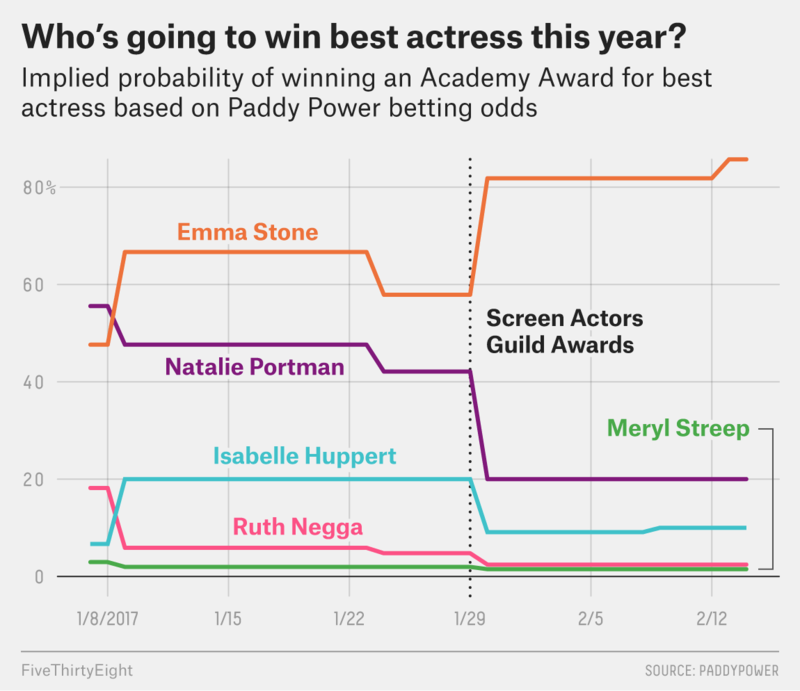 There are three actresses seriously vying for the Oscar, based on what earlier awards and nominations can tell us. Emma Stone (“La La Land”) leads the trio after wins at the Screen Actors Guild and the BAFTAs. She also won a Golden Globe for best lead actress in a musical or comedy, but that’s barely a participation trophy when it comes to predictive power. 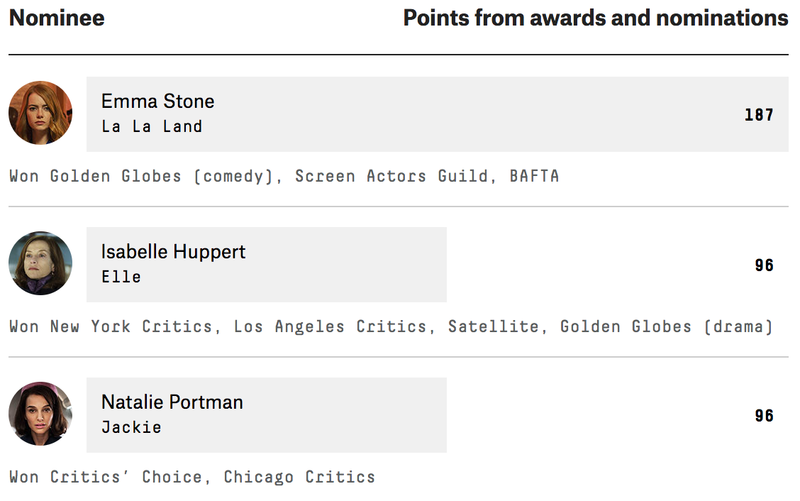 Isabelle Huppert (“Elle”) and Natalie Portman (“Jackie”) have the advantage of early support from critics groups; Portman won the Critics’ Choice and Chicago Film Critics Association awards, while Huppert won prizes from the New York and Los Angeles critics groups and, most significantly, pulled the Golden Globe for drama. But with two major wins at two highly predictive insider award shows, Stone is the one to beat. Viola Davis (“Fences”) is the overwhelming favorite here. The four most predictive awards for this Oscar category all lined up and gave her top honors. It’s not even close. Don’t bother betting against her. Mahershala Ali is the favorite, with a commanding series of wins among the New York, Chicago and L.A. critics and at the Screen Actors Guild and Critics’ Choice awards. The only concerning misses he’s had this season were a loss to Aaron Taylor-Johnson (not nominated for the Oscar) at the Golden Globes and to London-born actor Dev Patel (“Lion”) at the London-based BAFTAs. A surprise is possible but unlikely. Barry Jenkins (“Moonlight”) got love from the New York, L.A. and Chicago critics, but Damien Chazelle (“La La Land”) has been unstoppable: He won at the Critics’ Choice awards, the Golden Globes, BAFTA and, most importantly, the highly predictive — 21 correct in the past 25 years — Directors Guild awards. From the chart, you can see that “La La Land” has been a strong front-runner for a while now, and here’s why. The film started off with solid critic wins, including the New York Film Critics Circle and Critics’ Choice awards, a Satellite Award and the Golden Globe (for comedy). Still, it wasn’t alone in racking up wins from critics: “Moonlight” scored with the Los Angeles and Chicago critics and took the Globe for drama, while “Manchester by the Sea” picked up wins at the Satellite Awards and from the National Board of Review. But “La La Land” set itself apart by doing one thing: winning additional awards from insiders. 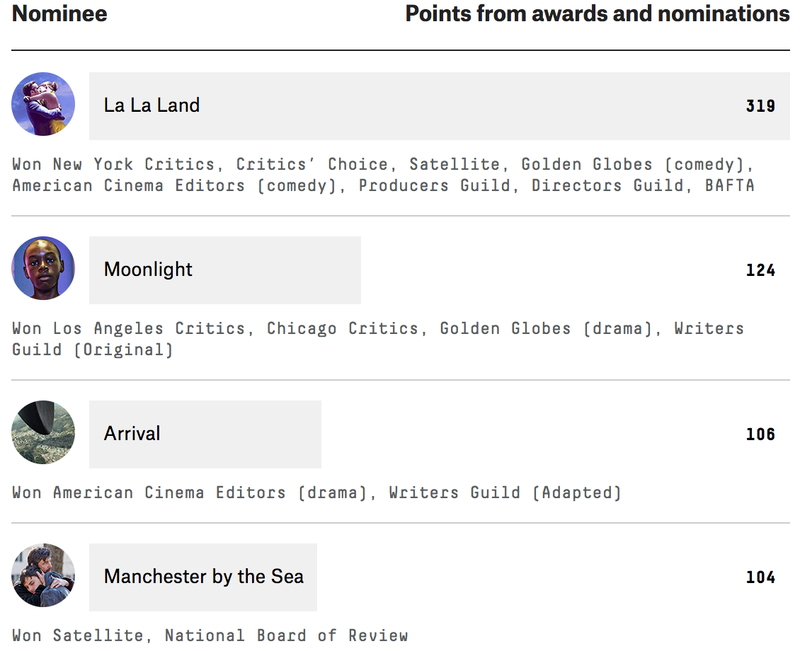 Aside from a win for “Moonlight” from the Writers Guild, “La La Land” has had more support than its closest competition. The film won top honors from the Producers Guild and the British Academy, while its director won the coveted Directors Guild award. Those are hugely consequential wins. Also, when “Moonlight” and “Manchester by the Sea” went head to heard over awards that “La La Land” wasn’t nominated for, they lost: The Screen Actors Guild award for best cast — the top prize — went to “Hidden Figures,” and the American Cinema Editors thought “Arrival” was the best drama. So “La La Land” is the favorite if only because none of the other nominees has a compelling argument that it should be considered a favorite. Although “La La Land” isn’t exactly a lock — considering how many awards it did not in fact win — a loss here would nonetheless be a surprise. This is the first year that we’ve applied our model’s methodology to the Oscar race for best animated feature, and because we have only 15 years’ worth of data at most — compared with 25 years for the other categories — there’s a little more uncertainty built in. With wins at the Golden Globes and from the American Cinema Editors and the Producers Guild, as well as the Annie award for feature animation, “Zootopia”1 is out in front. Given the uncertainty, though, it’s worth highlighting Laika’s “Kubo and the Two Strings,” which was one of the heaviest campaigners in industry publications after Oscar nominations were announced, according to a FiveThirtyEight analysis. It’s also our first year covering the documentary category, so bake in some uncertainty here too. “13th” won the BAFTA and the Satellite award, but according to our model, the front-runner here is “O.J. : Made in America,”2 based on wins at the Critics’ Choice awards and from the New York and Chicago critics, the National Board of Review, the American Cinema Editors, the Producers Guild and the Directors Guild.